The Montreal lawyer and sole female candidate for mayor talks about her passion for Montreal, why she's qualified for the job and why New York should be a model for tackling corruption. 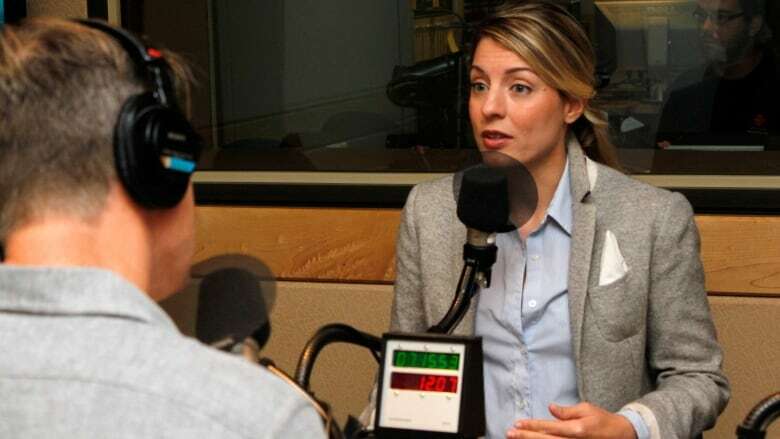 Montreal lawyer and sole female candidate for mayor, Mélanie Joly, talks to CBC's Daybreak about her passion for Montreal, why she's qualified for the job and why the city should look to New York to successfully combat corruption. Q: What is the most pressing problem facing Montreal? A: "The most important problem is corruption. It’s the lack of ethics of elected officials. What we’ve done, our platform is the best platform. Why? Because we identified all the problems in Montreal and then we looked elsewhere in the world, other cities, and what they did to solve these problems. "What Michael Bloomberg did in New York, he made sure everything would be transparent. All of the information the city has become public. Therefore, it’s best to make sure there’s not that culture of a person knowing another person." Have you ever had a bicycle stolen in Montreal? Yes. Two and the last was in front of my house in front of Parc La Fontaine and that was three months ago. Do you think Montrealers complain too much about potholes and snow removal? No. I think they’re right. I think the infrastructure is in really bad shape and there’s been not enough investments in the past years. If you do not win, would you consider being a star candidate for the Liberal party? It’s a no. I’m saying that I’m here to stay in Montreal. My heart is here. Before being a Canadian or Quebecer, I’m a Montrealer. Are you really in it to win it and not just raise your profile? No I’m in it to win and I’m there also to bring new people and new ideas. Q: Do you think corruption still exists at city hall? A: "I think so. I think there’s a lack of transparency. For example, if you’re an investor and you want to build in a certain borough and you basically have your mortgage on your land and you pay your architect and you want to present your project, you go before the city official and you don’t know whether your project will be approved or not and you don’t know based on which criterias and what’s the delay for the approval.So, we need to change that. "We need to clarify process, criteria that are clear and that are basically very rapid and that’s the best way to ensure there is transparency. People will want to invest in Montreal because they’ll have confidence in the system. Time is money and they’ll reduce their risk also." Q: People like Denis Coderre say you just don’t have the experience running things. What have you actually run that indicates you could run the city of Montreal? A: "I’m a lawyer and I’ve worked with national firms and also I used to run one of the companies of the Molson family [PR firm Cohn & Wolfe] and I did the entire restructuring and it went very well. I was in charge of the Montreal office and I was the youngest managing director in the entire network of 52 countries." "We have a fantastic team. We have a clear game plan. I have a lot of will, a lot of integrity, a lot of vision and that’s how we change things. If you look at big companies in the world, high tech companies, a lot of the people are my age." Q: You've drawn criticism from Jean-François Lisée, the minister responsible for Montreal, for speaking out too much about the Charter of Quebec Values. You said at a debate you would challenge it in court. Do you stand by that? A: "If the population is in agreement with what the city council would do, yes. But it’s based on the will of the people. That being said, I’m personally against it. "I would certainly do a public consultation. I want to make sure that people, the liberty of choice of people, is well respected. I want to see what the project is and what will be done by the Quebec government, but it’s important that Quebec understands that Montreal has a different culture, has a uniqueness in terms of its culture and that we affirm ourselves. "That’s the case culturally and that’s the case also economically. All our measures we’ve presented are based on that." Q: Would Montreal prosper in a sovereign Quebec? A: "I don’t know. I think that Montreal must affirm itself culturally. It’s important that we understand, that Quebec understands that Montreal is the metropolis. Montreal is half of Quebec and when Montreal doesn’t go well, the whole of Quebec doesn't go well." CBC's Daybreak is hosting one-on-one chats with the four main mayoral candidates in Montreal throughout October and invites you to put your questions to them directly in an online live chat immediately following the interview. Follow Daybreak on Twitter @cbcdaybreak.